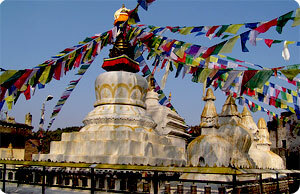 Himalaya Journey Treks & Expedition :: Namobudhha trekking | Namobuddha trekking tour | Namobudhha trekking information | Kathmandu Namobuddha trekking | Information about Namobudhha trekking | Namobuddha trekking |Namobudhha trekking itinerary | Namobudhha trekking | Namobudhha trek |Kathmandu Namobuddha trek | Namobuddha trekkingreise | Around Kathmandu valley trek | Namobudhha trekking Reisen |Information about Namobudhha trekking | Kathmandu valley sightseeing | Nepal trekking tour | Trekking in Nepal | Nepal Himalaya trekking | Nepal trekking agencies | Nepal trekking. Namobuddha, which lies in between Banepa and Panauti, is a famous Buddhist pilgrimage site as well as a favored stopover for trekkers. Rows of Buddhist stupas adorned with fluttering prayer flags are there to soothe tired trekkers and pilgrimage. Yet what draws their attention most is an image of the Lord Buddha in his compassionate manifestation. The carved stone image portrays a popular legend, which relates that the Lord Buddha in his previous incarnation had offered his own flesh to save a starving tigress and her cubs from the imminent death. Splendid breathtaking place: Relaxing with different himalaya & different culture.